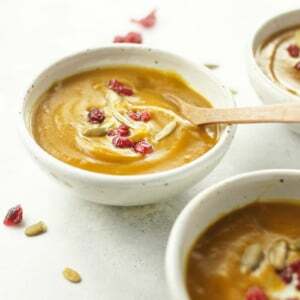 A creamy vegan soup that's slightly sweet and spicy. Perfect for winter! Hit the "sauté" button on the Instant Pot. Add in the olive oil and onion, and sauté until tender, about 8 minutes. Add in the garlic and curry powder sauté just until fragrant, about one more minute. Turn the Instant Pot off for a moment, then add the butternut squash, salt, and water into the pot. Cover with the lid and be sure to seal the top for pressure cooking. Select the "soup" setting, and let the soup cook at high pressure for 30 minutes. When the soup is done, I like to wait 10 minutes before releasing the pressure, but I don't think that's necessary if you're in a hurry-- feel free to use the "quick release" method by turning the valve on the lid from sealing to venting. Whichever method you use, just be sure that the pressure is totally released before attempting to remove the lid. It releases very easily when the pressure is removed. Return the blended soup to the pot and stir in the coconut milk. (You can use coconut cream, if you don't mind a slightly creamier soup.) Adjust any seasoning to taste at this point, I usually add a touch more salt, and serve warm. Top with hulled pumpkin seeds and dried cranberries, if desired. Leftovers can be stored in an airtight container for up to a week in the fridge.